Anger can be very quick, powerful, reactive, and can make us do things we typically wouldn’t do. There is nothing inherently wrong with anger as an emotion, but nowhere is anger less helpful, more common, and potentially more dangerous than when we are behind the wheel of a car. Most of us are familiar with “road rage”. There are, of course, extreme examples of violence and assaults on the roads that end up in the courts, hospitals, and the media. But every day, drivers get angry and aggressive, and the evidence is mounting that this can put themselves and others at great risk. Usually road rage is triggered by a specific event. These events will often involve the actions of another driver, such as a slow driver, a driver changing lanes without indicating, or other behaviours that we interpret as a threat or an obstacle. other factors such as the anonymity we feel in the car, or the inability to communicate in another way. In fact, a range of behaviors stem from driving when angry, including everything from honking the horn, yelling abuse and demonstrating hostile gestures, through to tailgating or dangerous manoeuvres on the road, and ultimately getting out of the car to carry out verbal attacks or physical violence. A recent study confirmed the link between “driving anger” and certain aggressive and risky behaviours when it found anger while driving significantly predicted aggressive driving, risky driving, driving errors, as well as number of accidents. And it’s not a new phenomenon. The idea that generally decent people become full of anger and rage when they hop into a car has been with us since the advent of cars themselves. Remember the 1950 Disney cartoon, “Motor Mania!”, starring Goofy. At first a mild-mannered everyman, he turns into a monster the moment he gets behind the wheel. I’m a great driver, what’s wrong with everyone else? Worryingly, a study of 220 licensed drivers found that along with driving anger, the driver’s bias towards their own illusion of control predicted aggressive behaviour. Drivers who believed (perhaps falsely) they were in greater control of their situation, due to superior driving ability or skill, were more likely to drive in risky and aggressive ways. Driving anger and the illusion of control are a dangerous combination. On the one hand, a person who is angry and holds the belief they are in control of the situation is more likely to drive in a risky and aggressive fashion. On the other, research has demonstrated our various cognitive functions, such as attention, reasoning, judgement and decision-making, can be impaired by anger. The result is a perception of lower risk, a greater willingness to take risks, and cognitive effects that actually increase the risks. Fortunately, there is emerging evidence that psychological interventions hold hope for angry drivers. 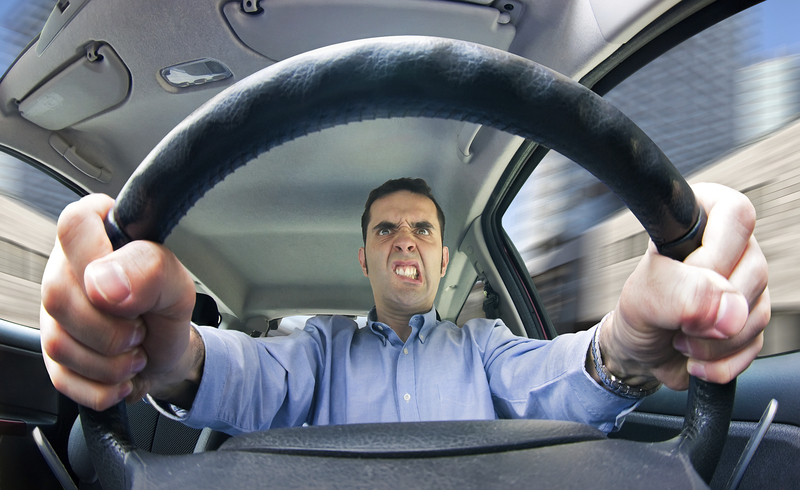 A recent review found evidence supporting cognitive and behavioural interventions to reduce and manage driving anger. This includes changing anger-evoking cognitive patterns or faulty thinking (such as those interpretations listed above), learning relaxation coping skills for when anger is aroused, and finding strategies to solve difficult situations on the road and de-escalating anger so our choices are less aggressive and more safe. focus your attention on safe, calm driving, ensuring you get yourself to your destination safely and without incident.